Our Harvey disaster relief teams are officially back home. Looking back at the past few weeks and now even months, it is incredible to see how God moved as we responded to our neighbors during such a devastating time. 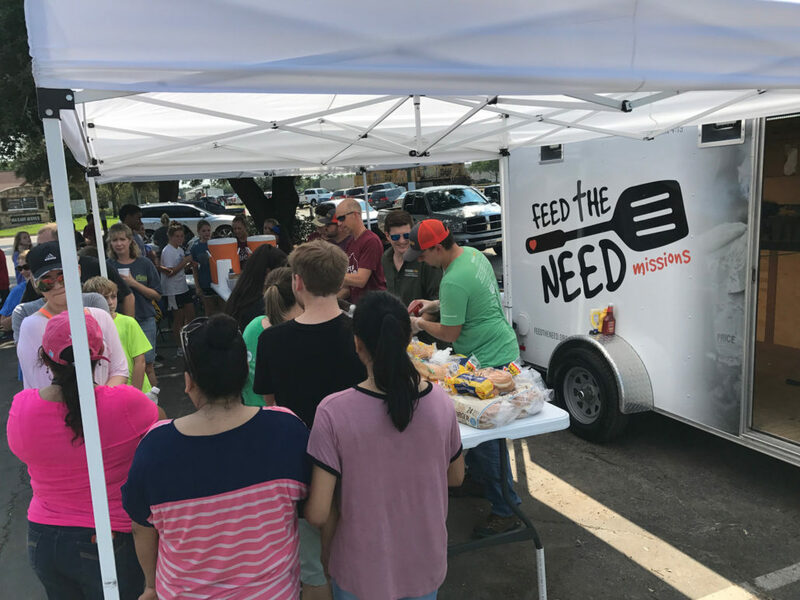 When Hurricane Harvey made landfall on August 25, 2017, Feed the Need Missions had already started gearing up to provide disaster relief to the communities in our area. Our first response was to the flood evacuees in Bastrop County serving three meals a day at the Smithville Recreation Center. From there we sent out teams to Giddings, La Grange, Houston, Katy, Bloomington, and beyond. Because we have been preparing to respond in times of disaster, we were able to utilize equipment and volunteers we already had and respond quicker in this time of need than we ever have before. Overall we went into nine different towns and served over 28,000 meals, with the majority of those being served in the first two weeks of response. Thousands of people were able to receive a hot meal because of the support of our donors and volunteers. And we just wanted to say THANK YOU! We know you have been following our journey in response to Harvey–whether it’s through prayer, sharing information, volunteering, equipment donations, or your financial support–it has not gone unnoticed. We are so overwhelmed and blessed by this and truly believe we have the best supporters around. While our teams have wrapped up for now, there is still much work to do as recovery continues. Prayer is still very important, so keep praying for those affected by this disaster. If you are still interested in volunteering to help aid in recovery, we encourage you to check out Samaritan’s Purse. We were able to partner with them during this disaster and they are doing great work in the Harvey devastated areas. And lastly, we can always use your continued support as we start preparing to respond to the next disaster. These funds help us respond quicker and prepare better for when the next disaster strikes. Simply click here and select ‘Disaster Relief’ as the designation on our secure donation form. Thank you again, we are so glad you are part of this story.